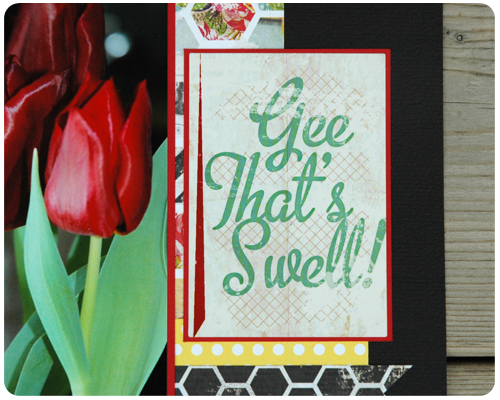 Crafty Cucumber: Gee, That's Swell! 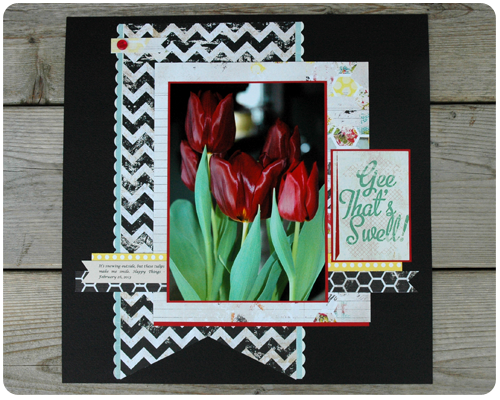 This week The Memory Nest Design Team was asked to create a layout using Cashmere Dame by Glitz. 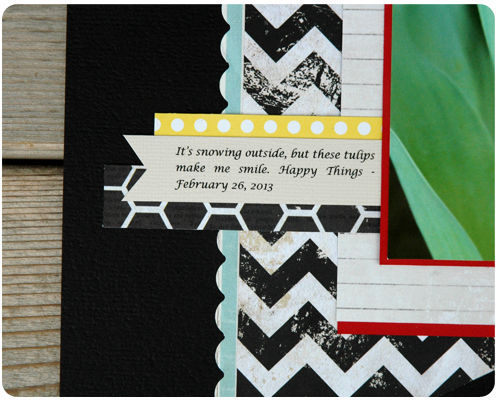 It is bold paper - bold colors and patterns, with large, retro looking coordinating stickers. Since the paper was bold to begin with, I decided to go a little bold in my photo choice and scrap a picture of my tulips that I bought in desperation this past winter (desperation that winter was nowhere near over, that is) and was having a heck of a time finding coordinating paper for. Somehow the leaves and stems in the picture were an unusual green color, making the photo hard to work with...that is until I saw the greenish turquoise color used on this paper and a match was finally found. When my layout was complete, I decided to combine the scraps of paper that I had left with another of the coordinating stickers to make a card. Many of the stickers in this line would be great for cards. This is great paper. The bold patterns were really fun to layer together and made for some really funky creations. Head on over to The Memory Nest today to see what the other Design Team members created using this paper line. I mean really! It is beautiful. I look forward to your layouts every week. Thanks so much for stopping by and for your sweet comment Jessica. The bold and crazy patterns are so fun! I love the bold and crazy patterns too! I am always happy to link up to your party. Thanks for reading. The tulip picture looks great in this layout! I love little memories like this - such a real way to document life. :) I also think it's neat how you used your scraps to make a card. I think I might try that soon! Thanks for sharing. Absolutely. I have been trying to document the little moments of life a lot more lately. I think it will be fun to look through my albums in the future and read about not only the special events and big trips, but the moments that made up the everyday. Thanks for reading. You did a great job with the bold patterns. Thank you Lanaya. I appreciate you stopping by each week.